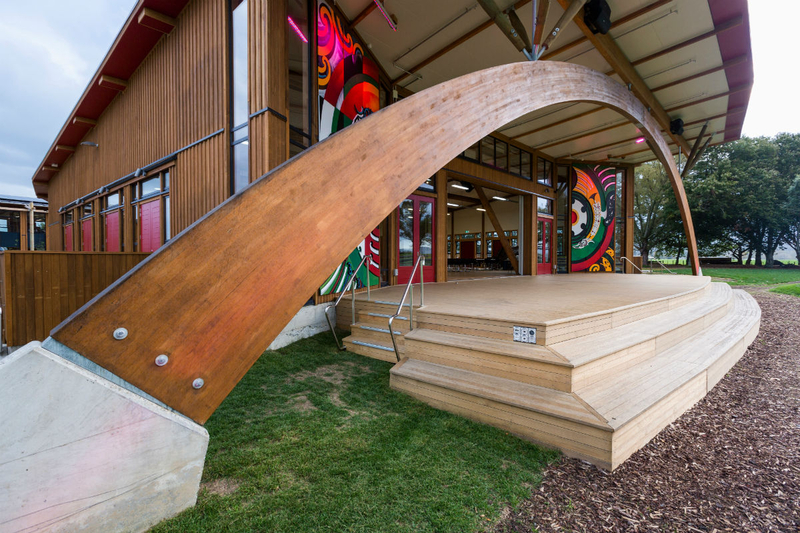 A 23m timber arch was designed to span the front entrance of the building, representing the arch of the Tūhoe Te Mana Motuhake flag symbolising the continuity of time, whakapapa and culture much like the rising and setting sun. The arch represented an engineering challenge and eventually made from glue-laminated timber, set into two large concrete plinths which carry the load of the front canopy down to the ground. There was much anxiety on the day of installation. Would the theory of the calculations stand up? Had the builders stuck to their calculations? Were the concrete plinth located in the create position? Judge for yourself! The arch came to site in two pieces and had to be lifted by crane into position. Our lead carpenter, Jason Marra was up on a scissor lift where the two should meet in the middle. Like a conductor we resorted to hand signals to instruct the crane drivers to raise, lower or shift the arch into position. When the arch was sitting snuggly on each of the plinths we could still see Jason’s head between the two sections, and Jason isn’t a small man.